Falvey Memorial Library recently completed a major digitization project to make available online all 1,713 issues of the campus newspaper, The Villanovan, published between 1893 and 1995. 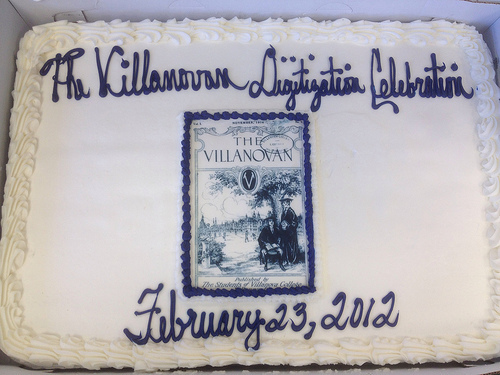 On Feb. 23, the Library hosted a program to celebrate this accomplishment. 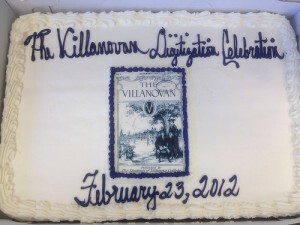 The celebration was dedicated to the memory of longtime Villanovan faculty adviser, June Lytel-Murphy. The program began with introductory remarks by University Librarian Joseph Lucia and University President the Rev. Peter M. Donohue, OSA., PhD, ’75 A&S, who characterized the project as a history of “the voice of the student body.” Special Collections and Digital Library Coordinator Michael Foight, Library Technology Development Specialist Demian Katz and Research Support Librarian Susan Ottignon each addressed various aspects of the project. Prior to 2011, The Villanovan was available only through bound volumes of issues or microfilm—neither providing an especially pleasurable experience for casual perusal…. The above paragraphs were excerpted from David Burke’s article about the event on the main library news blog. Click here to read his full article. Since the event, we’ve seen a huge increase in use of this collection. Michael Foight reported that we had a record 1009 unique visitors to the Digital Library in the week following the event and most of those visitors were browsing the Villanovan collection. 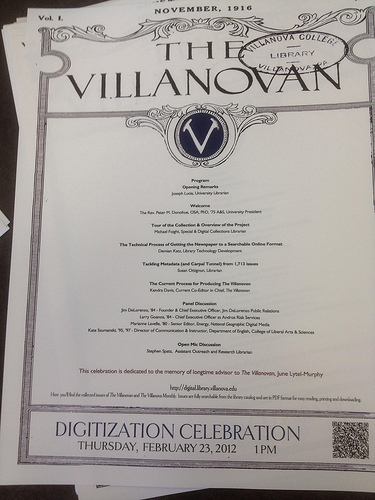 We’ve written about the Villanovan digitization project previously. Michael Foight wrote about the initial phase of this digitization effort in December 2008. Cathleen Lu, Digital Library Intern in Fall 2010, wrote about some of the more eye-catching advertisements she found in the papers while working to improve the PDF files. And last year Laura Bang wrote about the 10,000th item to be added to the Digital Library, which happened to be the April 4, 1944 issue of the Villanovan. These papers provide a fascinating look at not just the University’s history, but also the historical context around the University and how world events affected life at Villanova. Take a look and see what you discover! Digitalization is a great way to make history alive and so that it will give the young opportunity to feel history without damaging it, isn’t that so? Congrats on the project!